Having attended a number of national shows over the years and having spent a lot of money in the vendors room, I feel at least a bit qualified to offer the vendors some advice. Mind you, I come at this as a consumer, so take it for what it's worth. Say hello to me. Most of us are introverts, but it’s nice to see a friendly face and engage in a bit of banter. Put a price on everything. Please. There’s nothing more annoying than finding something interesting in a stack of models and not knowing if I can afford it. Sure, I can ask you, but if you haven’t priced anything I'm paranoid that you’re just throwing out a price based on the expensive Ralph Lauren polo shirt I’m wearing (collar up, of course) or the Rolex on my wrist. More likely, you’re busy talking to other customers or friends, which means I have to be pest and interrupt you or wait around like a troll. Either way, I’m not happy. I’ll probably move on. Don’t be a salesman. I don’t need you to tell me what I’m looking at or give me it’s history. One vendor who frequented shows throughout the Midwest was very adept at this. 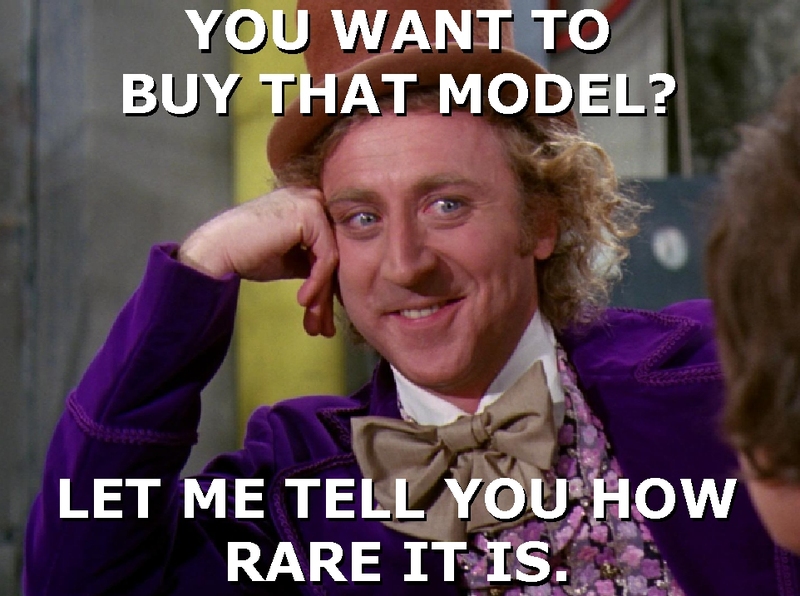 No matter what you’d pick out from his (unpriced) stash he say, “That’s a very rare model.” If I’m at the IPMS National Convention, you can assume I know what I’m looking at. If a kit has been opened, price it accordingly. I’ve bought opened kits in the past only to discover later that pieces were missing. I’ll take that risk, but not at near-retail prices. My suggested rule of thumb: If a kit has been opened (and the parts not in factory sealed bags), price at 50 percent of its retail value. Don’t insult us with insignificant sales. You're offering 5 percent off everything. Seriously? That’s 50 cents on a $10 model or one dollar on a $20 model. We’re looking for bargains, and a sale like that really isn’t going to incite me to buy. Better not to have a sale. My best wishes for a profitable weekend!